The project consists in a series of black and white laser prints on paper, in a size of 10 x 10 cm, printed at a resolution of 100 pixels by cm. 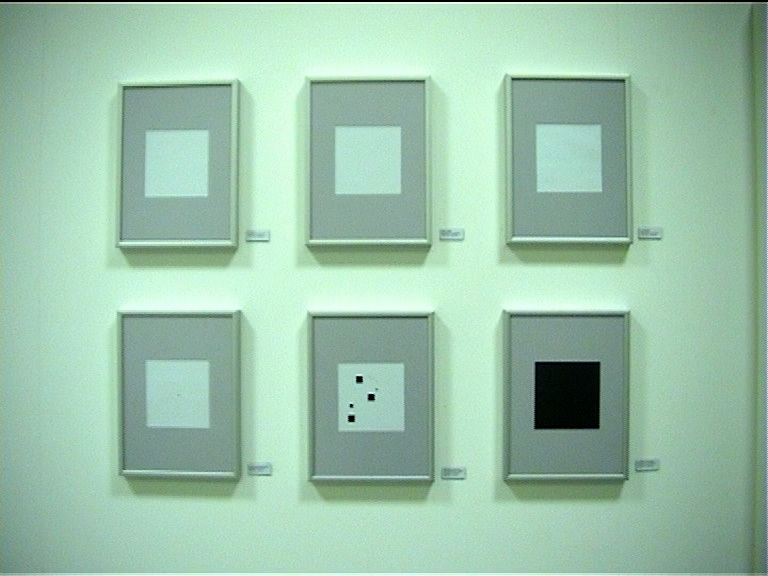 Each of this 10 x 10 cm squares is therefore covered by a specific number of black pixels located between zero and 1’000’000. The most important parameter in this project is of a financial nature. Indeed, the price of each print increases exponentially according to the number of pixels displayed, following the formula «10 raised to the power (number of pixels)». 1 pixel = 1 $, 2 pixels = 10 $, 3 pixels = 100 $… To illustrate the price of the last print (one million pixels), a catalog of 217 pages was required. The series is accompanied by an audio release following a similar logic: a MiniDisk exploited to the maximum of its physical capacities, comprising 250 tracks of less than one second duration – a technical challenge which almost no minidisk manages to read without stuttering. This staccato rhythm is followed by a ten minute sound piece, generated from a time-stretched minidisk recording error. This sequence has a track title reaching the maximum lenght of 1200 characters – the display of an average minidisk player needs more than 15 minutes to show it fully.